On Wednesday, Roderik Lindenbergh from TU Delft (NL) gave an exciting talk on robust geometry extraction in large spatial point clouds in the frame of the IWR colloquium at the Interdisciplinary Center for Scientific Computing. 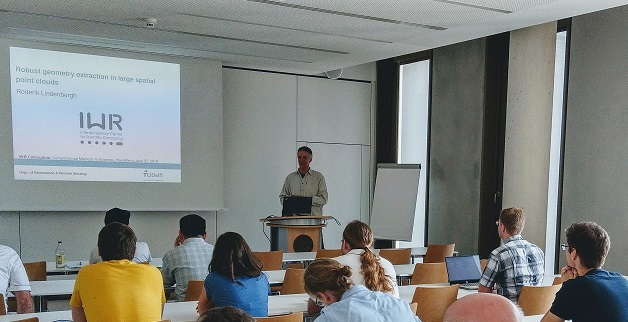 With focus on robust and novel methods of geoinformation extraction from these special datasets, the audience was taken on a journey through Prof. Lindenbergh’s research on Optical and Laser Remote Sensing. During the talk we learned about challenges - from easy to difficult - in 3D point cloud analysis and a variety of examples how to solve them. A particularly topical subject is the analysis of deformation from large 3D point clouds, i.e. the quantification of changes between datasets from multiple points in time. While many methods have been developed already, new challenges are emerging with evermore dense time series data becoming available. 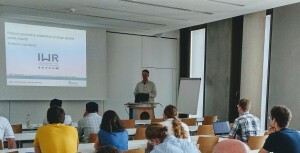 In this context, the presentation further gave a peek into the CoastScan project of Sander Vos, Roderik Lindenbergh and Sierd de Vries on permanent laser scanning of sandy beaches. In cooperation with the team from TU Delft, beach monitoring is one of the use cases of the Auto3Dscapes research project, where the 3DGeo is developing a novel approach of autonomous 3D Earth observation based on time series of 3D point clouds. We thank the IWR for this opportunity of meeting and discussing research and challenges in computational 3D geoinformation extraction!